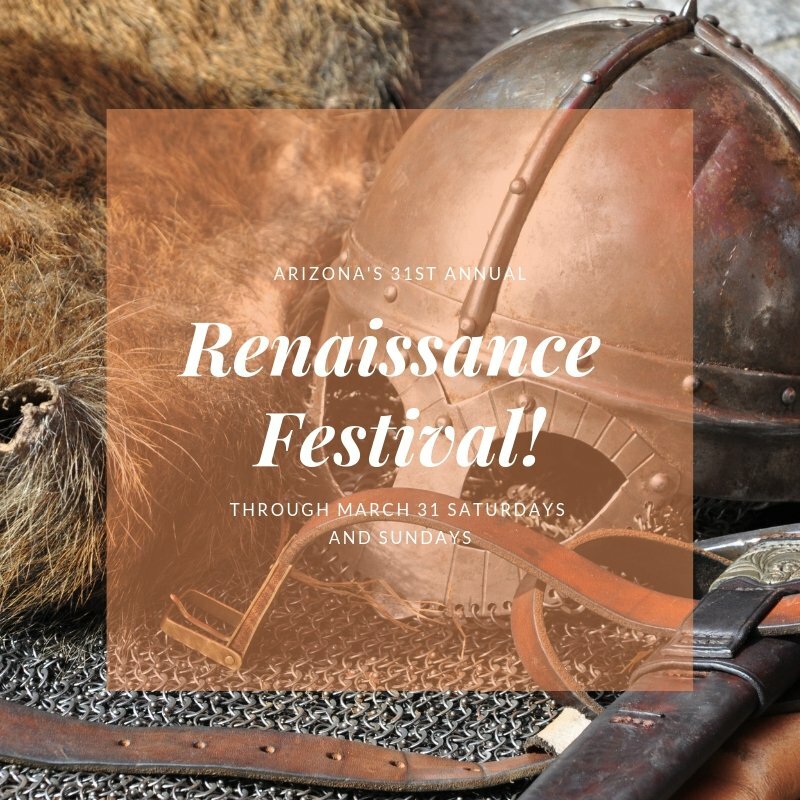 The 31st annual Arizona Renaissance Festival is currently going on through March 31 at 12601 E. US Highway 60 in Gold Canyon. Admission is just $28 and $18 for children five through 12. It reoccurs weekly on Saturday and Sunday from 10:00 AM to 6:00 PM. This unique Festival is a mid-evil amusement park with a 14 stage theater, 30 a circus, arts and crafts fair, a jousting tournament, and all the food you can eat rolled into a nonstop, daylong adventure. This outdoor event combines entertainment from a time gone by around the 16th century featuring a European village market celebrating the arrival of the King to their Shire. Once you walk through the gates to be transported to a simpler, more jovial time. There are over 2000 costumed characters, games of chance and skill, giant roasted turkey legs, and over 200 artisan shops displaying unique wares of the time. You can watch the ancient skills of glassblowing, weaving, wood carving, candlemaking, leatherwork, pottery, and blacksmithing. There are 14 stages with comity, swordplay, music, and more. New this year are five escape rooms to test your skills designed by Escape Rooms Mesa. There are five different themes including the Sword in the Stone, Merlin, Pirates, Enchanted Forest, and The Plague. You can even get 20% off of your escape room adventure when you mention visit Mesa or you can get a free coupon on their website here. Chivalry is alive and well at the Renaissance Festival!, Enjoy an exclusive pleasure feast, student days, nonstop entertainment, a fantastic marketplace, and seemed weekends. Browse the website for the schedule of events and what’s happening and schedule your Renaissance weekend today.